Sougia ( Σούγια ) is a small town located in the southwest of Crete. This place is still outside the main tourist trail. Not counting tourists returning from the Samaria gorge, this place is visited by a few people for whom peace and quiet are an advantage and not a disadvantage. In recent years, thanks to the improvement of the road connecting this place to the north of the island, Sougia has become a popular tourist destination for the inhabitants of Chania. Metropolitan Cretans often resort to weekend outings, during which they use taverns serving extremely good dishes. Although this place looks very modern and seems to be devoid of history, in reality this place has been inhabited since antiquity. Sougia's greatest flowering occurred during the reign of the Romans and Byzantines. During this period, this town was one of the important trade nodes. The extremely high position of Sougia is evidenced by the fact that, like other independent cities, it was able to mint its coins. In ancient times, Sougia served as a port for the Doric city of Elyros, whose ruins are located in the area of ​​the modern village of Rodovani. Syia, or the ancient name of the village, comes from the word sys meaning a pig. Sougia's old commercial character allows us to suppose that this animal could have been one of the main goods exported from the port located in this place. It is worth knowing that until the mid-1950s, this area of ​​Crete was devoid of convenient road connections. At that time, Sougia was still a port constituting an important communication and commercial hub for the inhabitants of the surrounding villages. The place even had a permanent connection to Piraeus. There was also a school in Sougia, where 150 students were studying. Since the construction of a comfortable road, this place has completely changed its character. In the 1960s, Sougia, like many other towns in the south of Crete, was discovered by hippies. This moment can be considered as the first nucleus of modern tourist traffic, which is the core of the current inhabitants of Sougia. The main beach located in this town is called Selino (Σελινο), which in Greek means celery. It's hard to say exactly what this comparison refers to but you can guess that it may be related to the shape of the beach, which looking from above resembles a long narrow branch of celery. The central part of the beach, located directly opposite the buildings of Sougia, is well organized. On site you will find paid sun loungers, umbrellas and fresh water showers. The road leading along the waterfront is adjacent to numerous taverns, whose tables are often exposed in the shade of tamarisks growing on the northern edge of the beach. The vast majority of tourists will find here almost everything that is needed for a successful holiday. The eastern edge of the beach behind the dried-down riverbed is devoid of amenities. Naturalists and people looking for more privacy are eager to relax in this place. The beach is covered with a delicate gray sand that gravel and stones. The shore falls relatively steeply and the water quickly gets relatively deep. Unfortunately, this is not conducive to families with small children. The great advantage of this beach is the incredible color of the water and its transparency. People focused on active nightlife should avoid this place from afar. 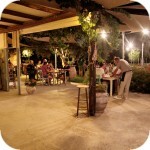 Modern disco is fortunately a fiction that has not yet reached this area of ​​Crete. However, if you enjoy the opportunity to go hiking, you should consider staying in Sougia. The village is a great base to visit Samaria. At the peak of the holiday season, you can easily get to Xyloskalo, the northern entrance to this gorge. Thanks to the ferries running on the Agia Roumeli - Sougia - Paleochora route, you will also have no problem with the return route from the Samaria Gorge. At the peak of the holiday season, Souga can also reach the island of Gavdos and the beach of Elafonisi located on the southwestern tip of Crete. There is now quite a good accommodation available in Sougia. The growing popularity of this place among tourists means that in the future new hotels will be created here. The vast majority of objects available at the moment are small family pensions. 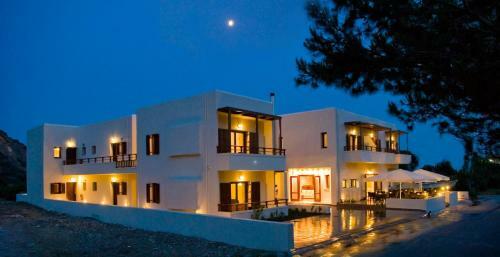 Offered rooms are characterized by a typical Greek standard and a relatively small booking price. While browsing offers on booking.com, our attention was drawn to the three - star Syia hotel built in 2008. This relatively new property is just 200 meters from the coast. It offers air-conditioned, spacious, well-furnished and contemporary studios and apartments. Each one has a kitchenette with basic equipment. It is worth mentioning that this facility enjoys exceptionally good reviews among its guests. More information and the possibility of booking rooms can be found directly on booking.com. However, if you are looking for something at a more affordable price, Idomeneas apartments , which enjoy equally good reputation, can be an interesting offer. A bit simpler equipment having a much more Greek character, consists of original wooden furniture. Each apartment has a small kitchenette with equipment that allows you to prepare your own meals. More information and the possibility of booking rooms can be found directly on booking.com.